Rosen came into the year with a lot of hype as he broke the 23-year-old IESA 2 Mile Record held by Jorge Torres, which was 9:52. Rosen smashed the record and ran a 9:43 for the 2 miles on the historic Maxwell Park XC Course. This was a big deal as Torres was one of the best xc runners the state of Illinois has ever seen. Torres was a 3-time xc state champion in high school for Wheeling, he took 2nd at state as a freshman with a 14:37 (the fastest time run by a freshman at the state meet until Charlie Kern of York ran a 14:36 in 2014), the only male in history to run in four foot locker national championships, a 7-time all-American in college for Colorado, the 2002 NCAA D1 XC National Champion, the 2006 U.S. Outdoor Champion for the 10,000 meters, and a Olympian in 2008 for the 10k. Expectations were high for the young star especially after running a 15:48 5k as an 8th grader at the AAU National Cross Country Championship. The amount hype and outside pressure may have made Rosen a bit nervous, as he didn't start his high school career as great as we thought he would; but he closed the year strong with some great performances. Rosen started his high school career with a great performance at the Moline Season Open running a 16:04 in trainers. It was the perfect small meet for Rosen to get his feet wet with high school action. His first real test would come at the Granite City Invite as he took 5th place with a 15:28.80. This was Rosen's first-ever cross country loss and it may have shaken him a bit, as that may explain his performance at the Peoria Richard Spring Invite. He came into the meet with many thinking he was a for sure a lock to take a top ten place but was a bit off that taking 22nd place with a new PR of 15:15. From there Rosen went south, seemingly to continue to test racing strategy, with wins at the Tom Oakley Invite, Liberty Invite, and Western Big 6 Conference Championship. 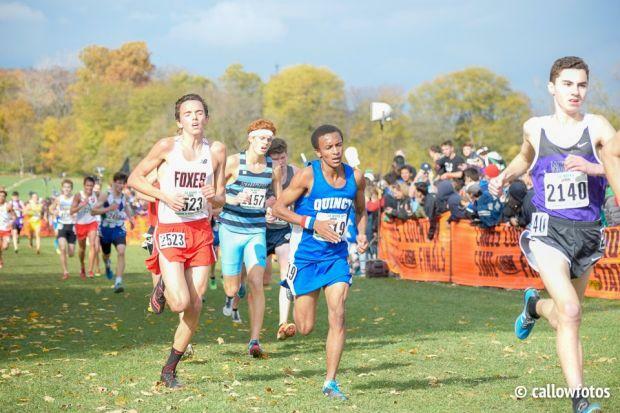 Rosen was the only freshman in Class 3A for boys to be all-regionals and all-sectional. Coming into the state meet it seemed as if Rosen was rolling with tons of momentum, but it didn't translate to the state meet. As a new runner to the scene he never truly experienced how fast the state meet is and he regretted not going out faster. He ran a 4:49 for his first mile leaving him in 90th place and he continued to drop back to 124th place. This was a real shock to the freshman phenom. But hopefully, he takes his momentum from a great performance at NXR Midwest and carries it into the track season as he looks to go all-state in the 1600m and 3200m. Congrats to Rosen as he is the 2018 Milesplit IL Boys Freshman of The Year!